Besides the creation of generally trophies like music trophy, tennis trophy, star trophy, etc; we also provide some special trophies forms "Soccer Man Trophy". This unique and interesting wooden trophy often used in some contest. This kind of trophy is very different one and so exclusive to use. Beside as prize of a contest, this wooden trophy can also used as a gift or personal collection as indoors decoration. Soccer man trophy made by professional craftsman and designed by those creative craftsman fromJava island, which famous of wooden handmade product. So if you want to give something different to your friend or your family, you may consider to give soccer man trophy as indoors decoration. You can write some words on the trophy and put it on the table. We can produce and supply a wide variety of wood trophy. 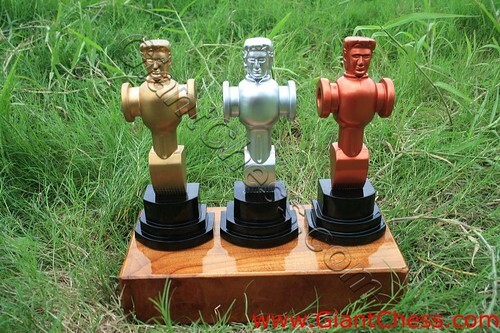 We have various trophy models and designs, so you can choose one.